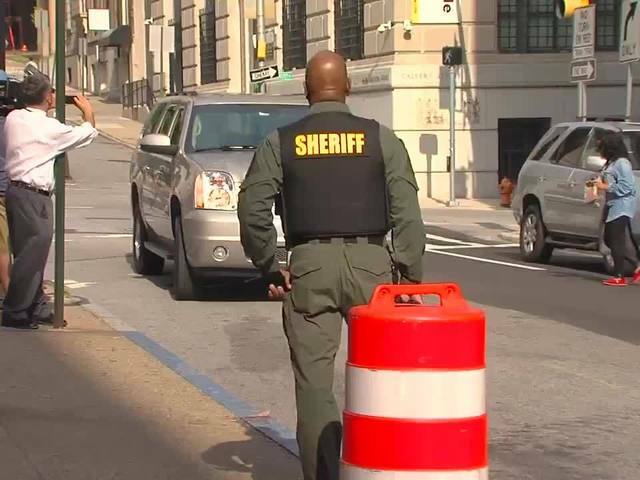 BALTIMORE (AP) — Prosecutors on Wednesday dropped all remaining charges against the three Baltimore police officers who were still awaiting trial in Freddie Gray' death, blaming police for a biased investigation that failed to produce a single conviction. Gray's death added fuel to the growing Black Lives Matter movement, set off massive protests in the city and led to the worst riots that Baltimore had seen in decades. Shortly after the announcement that charges would be dropped, a defiant State's Attorney Marilyn Mosby held a news conference, saying there was "a reluctance" and "an obvious bias" among some officers investigating Gray's death. "We do not believe Freddie Gray killed himself," she said, standing in the neighborhood where Gray was arrested, a mural of him on a wall over her shoulder. "We stand by the medical examiner's determination that Freddie Gray's death was a homicide." She walked up to the podium as people chanted "we're with you," and her remarks were punctuated by shouts of support. Gray's mother, Gloria Darden, stood by Mosby, saying police lied. "I know they lied, and they killed him," she said. Attorneys for the officers said justice had been served and praised the police department's thorough investigation. The officers have sued Mosby, saying she intentionally filed false charges against them. "The comments made today by Ms. Mosby were outrageous and not true," said Gene Ryan, president of the Fraternal Order of Police Lodge 3. "The Baltimore city police, they did the investigation and they said it was an accident," he said. "The Baltimore state's attorney had the opportunity to do an investigation and they did not. It is the Baltimore city state's attorney's office that denied justice to the Gray family and to these officers." The day started with a pretrial hearing for officer Garrett Miller, who had faced charges of assault, misconduct and reckless endangerment. But instead of pretrial motions, Chief Deputy State's Attorney Michael Schatzow told the judge that prosecutors were dropping the charges against Miller and the other officers. After Gray's death, Mosby wasted little time in announcing charges, waiting just one day after receiving the police department's investigation while a tense city was still under curfew. She did not shy from the spotlight, posing for magazine photos, sitting for TV interviews and even appearing on stage at a Prince concert in Gray's honor. The city's troubles forced Mayor Stephanie Rawlings-Blake to fire her reform-minded police chief and abandon her re-election campaign. She has taken a prominent role on the podium this week at the Democratic National Convention. Three of the officers who were charged are white and three are black. The victim, judge, top prosecutor and mayor are all African-American. At the time of Gray's death, so was the police chief. No reputations hinged on the case's outcome as much as Mosby's and that of her husband, Nick Mosby, a councilman for Baltimore's west side who announced his mayoral candidacy shortly after Rawlings-Blake left the race. He later pulled out. "We've all borne witness to an inherent bias that is a direct result of when police police themselves," she said.